Over the last month, US Biathlon’s Susan Dunklee has become a familiar face for competitors and spectators at World Cup medal and flower ceremonies, highlighted by her silver medal in the mass start at the International Biathlon Union (IBU) World Championships in Hochfilzen, Austria. 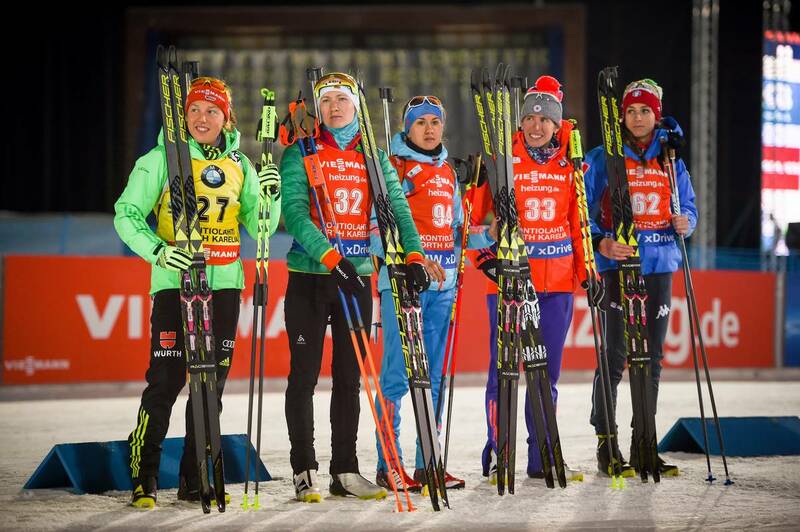 On Friday in the women’s 7.5-kilometer sprint at the IBU World Cup in Kontiolahti, Finland, Dunklee once again returned to the flower ceremony after finishing fifth, which, coincidentally, was her third time in a row in that place (excluding the women’s relay where the U.S. finished 14th). Last week in PyeongChang, South Korea, Dunklee placed fifth in both the World Cup sprint and pursuit. In four straight races (including the World Championships mass start), she has finished in the top five. After incurring one penalty in her prone shooting stage (1+0), Dunklee finished 34.9 seconds behind Norway’s Tiril Eckhoff, who won in 19:18.5 minutes, and 15 seconds off the podium. Dunklee’s split time after the prone shooting would only stand as the 34th-ranked time of the day, but with the 10th-fastest overall course time and a clean standing bout, Dunklee moved up significantly, pushing hard up a steep 230-meter-long climb nicknamed “The Wall” on the last loop to chase the times set by the leaders. Fourth was the position she initially finished in, but the very last starter of the field in bib 94, Daria Virolaynen of Russia, shot clean and bested Dunklee’s time by one-tenth of a second, bumping the American to fifth place. Like most of the 94 starters, Dunklee had just made the long trip to and from South Korea to test the venue for next year’s Winter Olympics. But she didn’t let the travel stress discourage her heading into the last two World Cup stops of the season, and even saw advantages. Kontiolahti is hosting the eighth World Cup stage of the season, replacing Tyumen, Russia, which would have been a significantly shorter flight from Asia, after Russia relinquished hosting in the wake of the McLaren report. For the clean-shooting Eckhoff, her sprint victory in Kontiolahti was her first win of the season and third of her career. 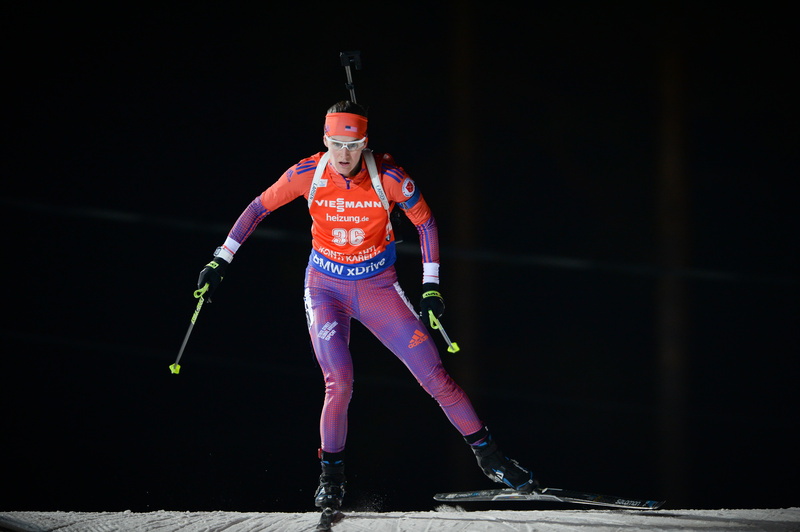 The star of the last year’s IBU World Championships at home in Oslo, Norway, Eckhoff failed to crack the top 10 in a non-relay race in Hochfilzen this season, but rebounded at the PyeongChang World Cup with a second place in the sprint and relay. In an interview with German broadcaster ZDF, Eckhoff explained she was proud to have surpassed the individual career wins of her older brother Stian Eckhoff, who now coaches the Norwegian women’s team. Starting immediately behind her on Friday, Germany’s Laura Dahlmeier, who had dominated this year’s World Championships and won the last six races, narrowly missed her seventh-straight win. Dahlmeier led the race after the prone stage, but then one of her standing shots hit the edge of the target, making it tremble but not flip over to turn white. Dahlmeier had to ski one penalty lap, and on the final loop, Eckhoff increased her lead by four seconds with the fastest final loop and second-fastest overall course time, leaving Dahlmeier 18.3 seconds back in second for her ninth podium in a row. Because her fiercest opponents for the overall World Cup Total Score title had weaker performances on Friday — with Gabriela Koukalová of the Czech Republic finishing 13th (+52.6, 0+1) and Finland’s hometown favorite Kaisa Mäkäräinen 49th (+1:50.4, 2+2) — Dahlmeier increased lead to 138 points over Koukalová and 204 over Mäkäräinen. Darya Domracheva of Belarus shot clean in both stages and was even with Dahlmeier at the last split time, but lost two seconds in the last few hundred meters to finish third (+20.4). It was her second podium finish of the season after a silver medal in the World Championships pursuit, returning to racing just a few months after the birth of her first child. All three U.S. women who raced on Friday finished in the top 60 to qualify for Saturday’s pursuit. 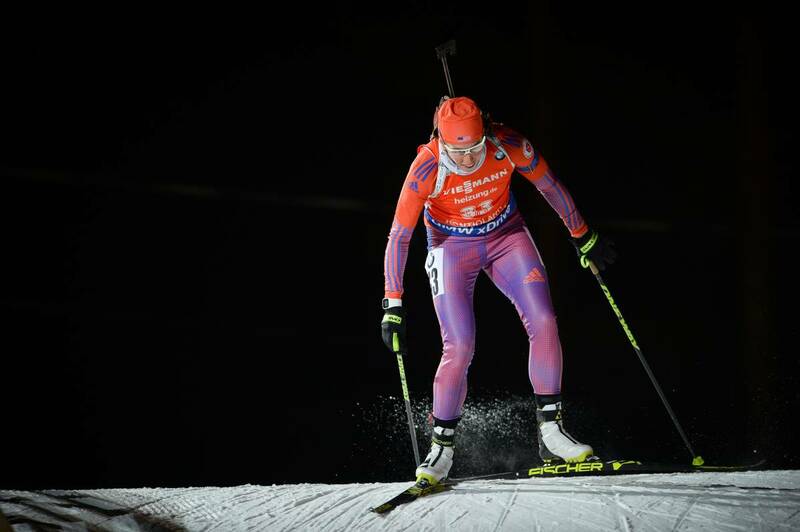 US Biathlon’s Joanne Reid managed to shoot clean in both stages and finished 55th (+1:59.7). Clare Egan was in 19th after a clean prone and skied a very fast second loop (11th course time on that loop), but three penalties in standing set her back. In posting the 24th-fastest overall course time, Egan clawed back a few positions on the final loop to finish 59th (+2:07.4) to narrowly qualify for the pursuit. Two Canadians qualified as well, with Emma Lunder in 56th (+2:02.8) with one miss (1+0) and Julia Ransom making the cut as the last qualifier in 60th (+2:08.0) with one penalty (1+0). In her first World Cup start, Canada’s 19-year-old Megan Bankes — coming off a gold medal in the individual race at IBU Junior World Championships in Slovenia — placed 78th (+2:56.9) with three penalties (2+1). Canadian Megan Tandy did not start due to a stomach flu. 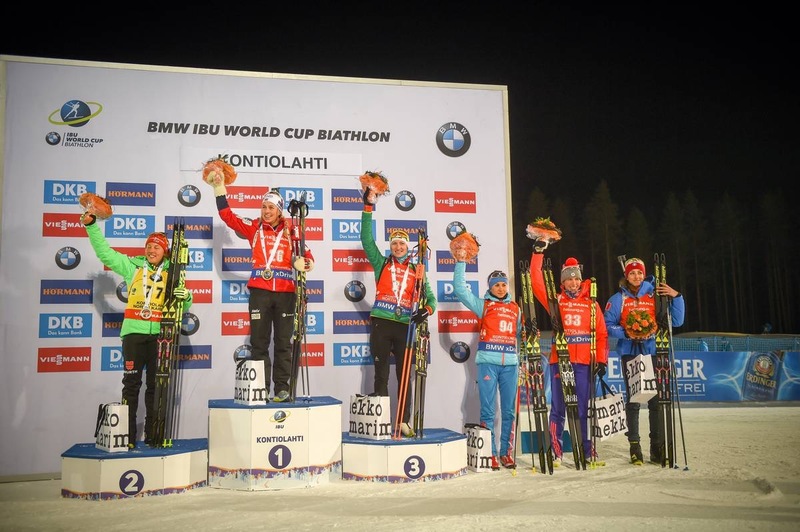 The post Dunklee Repeats in 5th; Eckhoff Gets First Win of Season in Kontiolahti Sprint appeared first on FasterSkier.com.